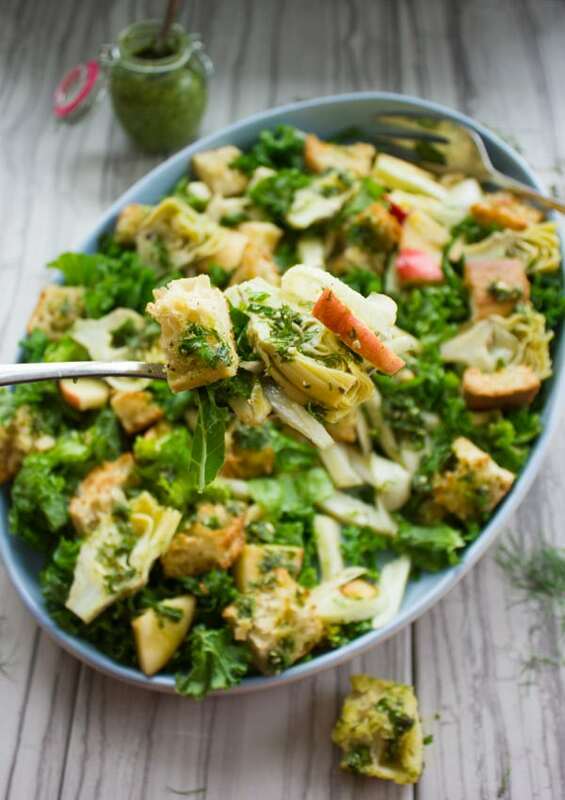 This gorgeous Italian Panzanella Salad with Kale, Artichoke Hears, Apple Slices, and Fennel makes for a wonderful springtime meal. Tossed with Basil Dressing and served with broiled salmon on top, this Italian classic is special and sophisticated enough to be served at any dinner party. Have you ever had Panzanella salad before? It’s a classic Italian bread salad, a Tuscan bread salad to be more precise. It’s a definitely one of those classic Italian salads you’ll have to try if you ever visit Italy! And it’s one you can easily make at home and vary with endless toppings and dressings. 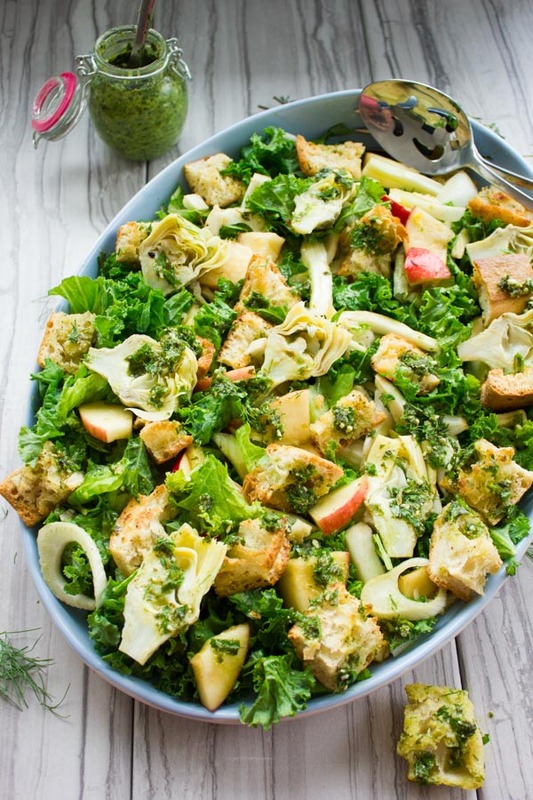 This Italian Panzanella Salad with Basil Dressing is loaded with artichokes, fennel, apples and crispy croutons! It’s amazingly filling crunchy and fresh tasting! If you’re making this Italian Panzanella as a main dish, simply broil a few strips of salmon and toss them with some of that bright and refreshing Basil Dressing too. This simple steps only adds 10 extra mins to your prep time, but leaves you with a satisfying, nutritious Panzanella Salad that you’ll make over and over again!! The base of an Italian Panzanella Salad is crunchy bread pieces. I crunch the bread cubes up in the oven with some garlic, olive oil, and fresh thyme, so it’s more of a crouton. Classically, in Italy, any stale old chewy bread is used for making Panzanella salad. I find that by crisping up the bread, the Italian Panzanella Salad lasts longer and the bread doesn’t get mushy for at least 6 hours. So what about the Panzanella salad ingredients? Oh my—the sky’s your limit! The classic Italian version focuses on tomatoes, red onions, some cucumbers, and a simple vinegar & olive oil dressing. These days, you’ll find Panzanella made with all sorts of veggies and fruit. Feel free to go with any greens you love. I’ve used kale here, along with some crisp Romaine, some sweet and crunchy sliced apples, sliced fennel and canned artichokes. 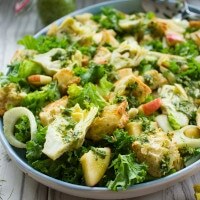 I absolutely love this combo because fennel has a sweet licorice taste which is absolutely fabulous with the garlicky croutons and slight bitterness of kale, More sweetness is added from the apples, while the artichokes add a nice salty contrast and chewy texture. Now, imagine all of these delicious ingredients drizzled with a fragrant, zesty basil vinaigrette. This Panzanella Salad just screams SPRING! If you’re vegan, this recipe is PERFECT—filling, fresh, crunchy, sweet and bursting with flavors! For the record, you can also use the basil balsamic vinaigrette from this Blackberry Pecan Roast Veggie Power Salad. To make this Italian Panzanella Salad, preheat the oven to 400 degrees F.
For the croutons, toss the bread cubes with all the croutons ingredients and spread them evenly on a baking sheet. Toast the croutons in the oven for 10 mins until crispy and slightly golden. Let them cool while you prepare the salad. If you’re making this Italian Panzanella Recipe with salmon, switch the oven setting to broil and adjust the rack to the highest rack. Toss the salmon strips in seasoning and olive oil, and place them in a single layer on a baking sheet, then broil for 5-6 mins until slightly golden and perfectly done. As for the dressing, I love using my protein packed nut free hemp basil pesto recipe, which I thin out with plenty of lemon juice and some more olive oil. If you’ve got prepared basil pesto on hand, that’s totally fine to use for the Basil Dressing. Should you not have any basil pesto, then simply add chopped garlic, plenty of minced basil, plenty of lemon juice, salt, and olive oil. Parmesan is a fabulous ingredient to throw in, and if vegan—I love using mustard instead of Parmesan cheese. It emulsifies the dressing beautifully and adds extra flavor! Place all dressing ingredients in a sealable container, seal well, and shake until all blended and emulsified. If you like a smoother creamier type dressing—place all ingredients in a blender or food processor and process until smooth. To add even more of that bright anis-like fennel flavor to the Panzanella Salad, I chop some of the green fennel fronds and add them to the basil dressing. On a side note- I ABSOLUTELY love those fennel fronds and it hurts me to hear that many people throw them out! They have a delicate mild sweet fennel flavor which you will love! 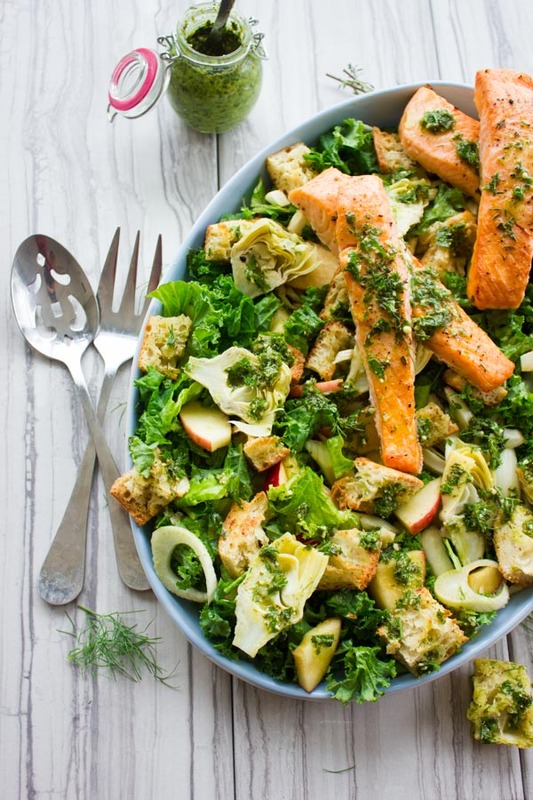 Assemble the Italian Panzanella Salad by tossing the salad greens, fennel and apples with 2 tablespoons of the dressing, then spread the salad on a plate. Top your Panzanella with the croutons, artichoke hearts and drizzle more dressing on top. 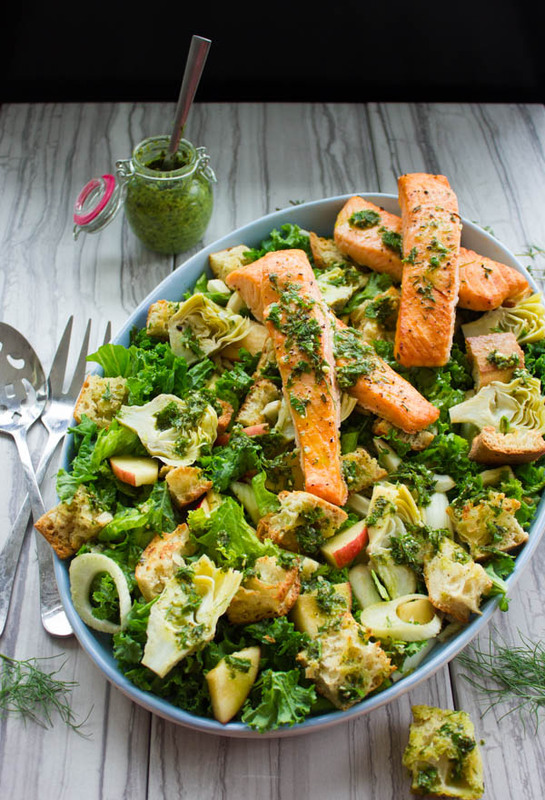 If you’re serving Panzanella with Salmon, arrange the salmon strips over the salad and drizzle each salmon piece with 1/2 teaspoon of the homemade basil dressing. This Italian Panzanella salad not only makes a delicious dinner, but it also makes an AMAZING BBQ side dish, a fabulous picnic salad, and a showstopper potluck dish! Save leftover Panzanella and have it for lunch the next day! Add some salmon to your Italian Panzanella! To do so, turn the broiler on high, season the salmon strips with salt, pepper and olive oil, then broil them for no more than 5-6 mins. The salmon even tastes YUMMIER with a drizzle of basil dressing on top once they’re cooked. If you’ve got leftover grilled chicken, steak, shrimps—they all work beautifully on this Panzanella Salad! Too busy to fry proteins? Even canned tuna works great, or some soft boiled eggs. Make this Italian Panzanella vegan by substituting mustard for parmesan and adding some fried tofu or tempeh on top. Want more spring salads? Try this Salmon Asparagus Sweet Potato Nicoise recipe. 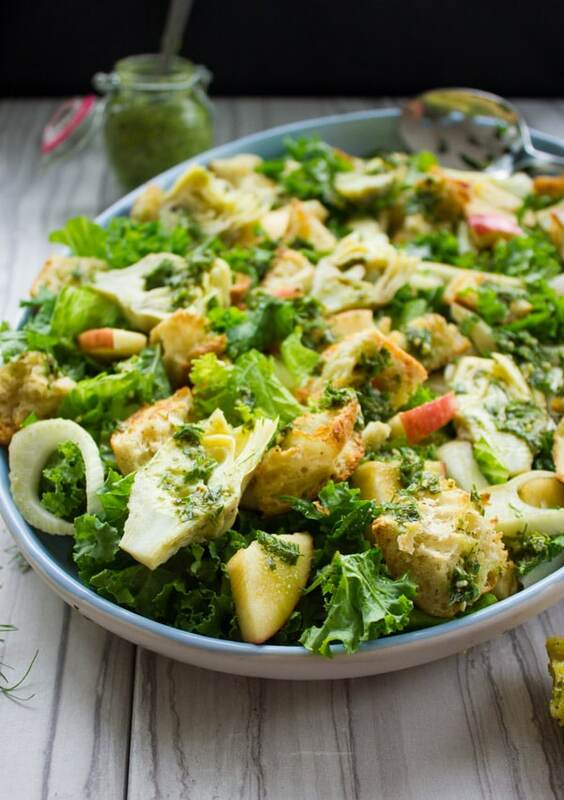 This gorgeous Italian Panzanella Salad with Kale, Apple Slices and Fennel makes for a wonderful springtime meal. 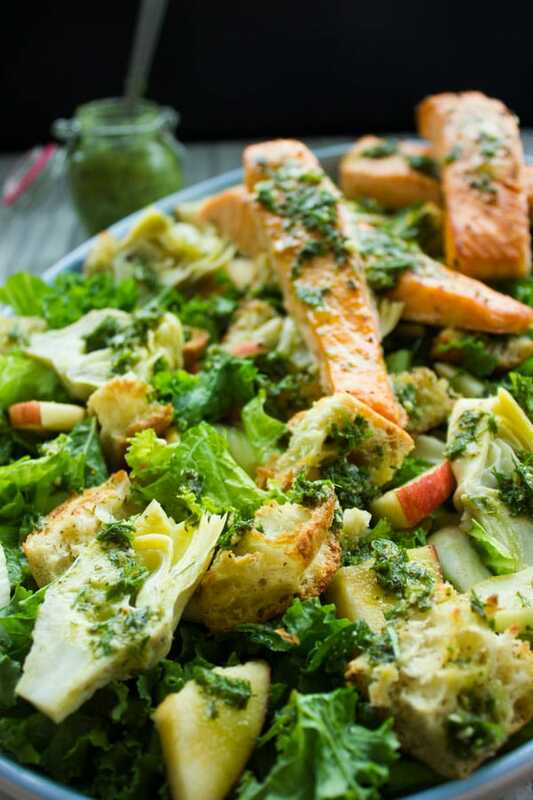 Tossed with a zesty homemade Basil Dressing and served with some broiled salmon on top, this Italian classic is special and sophisticated enough to be served at any dinner party or lunch. For the croutons, toss the bread cubes with all the ingredients and spread evenly on a baking sheet. Toast them in the oven for 10 mins until crispy and slightly golden. Let them cool while you prepare the salad. If you’re making the salmon, switch the oven setting to broil and adjust the rack to the highest rack. To make the dressing: Place all ingredients in a sealable container, seal well, and shake until all blended and emulsified. If you like a smoother creamier type dressing—place all ingredients in a blender or food processor and process until smooth. Assemble the salad by tossing the salad greens, fennel and apples with 2 tablespoons of the dressing, then spread the salad on a plate. Top with the croutons, artichoke hearts and drizzle more dressing on top (to your taste). If you’re serving the salmon too, arrange them over the salad and drizzle each salmon strip with 1/2 teaspoon of the dressing. Made a panzanella a few weeks ago but it didn’t look this good! Love that the dressing is homemade too! Thanks Jessica 🙂 –how did you make it? I’m curious which toppings you used–I love Panzanella!! The fresh basil dressing with the salmon sounds soooooo good. I love all the veggies and the homemade croutons as well!